One of the recycling bags for the coffee pods. 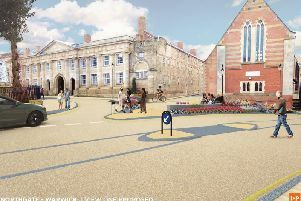 Photo supplied by Warwick District Council. Residents in the Warwick district will be able to take part in recycling trial for their coffee machine pods. Warwick District Council is launching a six month trial which allows households to recycle Tassimo coffee T DISCS and their outer packaging for the first time. The trial which runs from March 26 until September 23 is the result of a partnership between the council, coffee brand Tassimo, the council’s waste and recycling collection contractor SUEZ and recycling company TerraCycle. Previously coffee pods have not been accepted in household recycling collections due to the pods being a complex mix of materials that make them hard to separate and recycle. This trial will look at the effectiveness and feasibility of ways to recycle Tassimo T DISCS from households, and the level of uptake amongst local people. It is hoped the trial could help to identify the most suitable mainstream solution for coffee pod recycling for the future. Councillor Moira-Ann Grainger, Warwick District Council’s portfolio holder for neighbourhood services, said: “Warwick District Council is committed to offering residents the opportunity to recycle as many different types of materials as possible. “This is why we are delighted to partner with Tassimo, SUEZ and TerraCycle for this trial, which we hope will provide significant insights. Martin Andreasen, marketing director for Tassimo, said: “We are delighted to be partnering with Warwick District Council on this trial. “We are always looking for ways to improve our environmental performance and the trial will help us understand how different collection options for recycling would work for consumers. To take part in the trial, residents need to sign up on the council’s website: https://www.warwickdc.gov.uk/tassimorecycling. Households signing up will receive Tassimo recycling bags, which they can either place with their other household recycling boxes and bags on usual collection days or take the bags to Cherry Orchard recycling centre in Kenilworth or Princes Drive recycling centre, Leamington.